This IBC Big Screen session looks at how to turn the No. 1 irritant of modern cinema into something that enhances both revenue for cinema operators and enjoyment for the greater audience. Given that there are people who have been shot and killed for using their smartphone in a cinema, this is a highly topical discussion, with some leading practitioners and experts assembled to give their view and demonstrating some cutting edge innovations. Expect this session to go beyond the customary “now please tun ON your phone” jokes , though sadly there won’t be any demonstrations of the cinema ‘barrage’ types of big screen interactivity that have been making waves in China and beyond recently. Julian asks each of the panelists, “How did we get here?” not least given that cinema advertising was always about reels of 35mm ads. DCM’s Evea starts off by saying that “now that cinema have gone digital, they have become much more relevant for brands.” And with the advent of mobile, “it means that custmers can take the experience back with them.” He also stresses that cinema is the ultimate social medium. Mike from UK competitor Pearl & Dean observes that cinema audiences are not distracted and receptible to brand communication already in the cinema lobby. Scarratt from Yummi says that apps and platforms like Yummi add value to the advertising experience. Shazam’s Weedon points out that using smartphones in cinemas is a “natural evolution of consumer behavior, starting with consumers having one screen. Now there is an intelligence between the first and second screen. This word, engagment, makes me wonder what we ever did without it” The formal presentations then started. Weedon runs through key datapoints about Shazam, starting with 500 million users around globe, with 14-15 million new users each month. She puts Shazam firmly in the Web 3.0 space with the likes of Uber. AirBnB and Square, despite being older than those three combined. “This is our basic paradigm,” she says, highlighting television, cinema, radio, mobile display, in-store and live event. She then shows a cinema campaign that t he company did with Pearl & Dean by asking the next speaker to stage. Hope-Milne then show the Shazam ad reel with the Jaguar E-Type ad. It was probably impressive, but I had forgotten to allow the app to access my phone’s microphone. (Sorry, I use SoundHound). Then it is time for Shazam’s competitor (though neither would describe itself as that). Scarrat begins be stressing that they want to preserve the uniqueness of the cinema experience, but want to extend the connection to before, during and after the cinema. He then explains the Phonix audio watermarking technology, which also means that the Yummi add does not require wifi, 3G or internet. Yummi is a partner of DCM (Pearl & Dean’s very real bigger competitor). Yummi has launched in Japan, China, Singapore, Australia, Europe and US. So it is not as global as Shazam, Scarrat admits, but more focused. Evea points out that cinema want three things, not least of which is improved concessio sales. 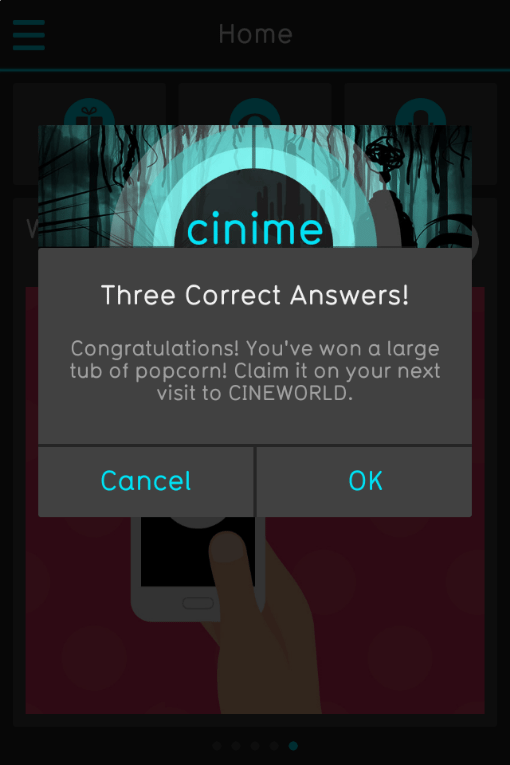 The idea of giving prizes is to have short window to redeem rewards, so as to drive the patrons back to the cinema. “Cinemas want to reach customers across multiple touch points,” he observes. “This is all new territory for us,” Evea aknowledges, “We are constantly learning and itterating.” He then revealed that DCM is currently working with a games developer to come up with something exclusively for the cinema second screen. “The third partnership is film distributors, who have a lot of content outside of just trailers,” Evea notes, particularly as trailers can only be shown within a window of 12 weeks before the film’s release in cinemas. He shows a Transformers 4 clip that allows Cinimi users to win a holiday. So as not to disrupt the cinema viewing, the reward can only be unlocked an hour later. Evea then finishes by showing the result of the BMW partnership where Cinimi viewers took part in an on-screen race to select break and acceleration points. Participants received a video of their virtual track and BMW was very leased with the impact of the camaign, stressing that it is always keen to work with cutting edge technology. Pinn then summarizes the technical process of Shazam listening in to content that it knows, which then triggers a response, while Cinime listens to hidden audio cues that unlocks content that is pre-loaded onto the phone. Scarratt elaborates that the phone downloads the content whenever it is on wifi earlier, “as historically there hasn’t been much wifi in cinemas” it then only uses the audio trigger. Shazam uses a unique identifier, so the app is not reliant of just one technology. It is worth pointing out that the Cinimi app can also identify posters. Pinn then asked Weedon about how Shaam is informed by its experience with interactions on other screens. She revealed that Shazam gets used a lot in cars (“By passengers only,” Pinn interjected),which is why the company launched Auto Shazam that tags everythingin the background. “So the key is to look at behaviours and tailor solutions to that. The more you do that, the more natural it becomes for the audience,” she notes. Pinn then open to questions from the floor and from Twitter. First question is whether people can get their smartphones out and launch the app fast enough. Scarratt says that they want to condition audiences to expect the Cinimi before the film. DCM’s Evea then talks about working with exhibitors to raise awareness, “but there is obviously still work to do.” P&D’s Hope-Milne stresses that this is an opt-in so people can use it but they don’t have to. Pinn asks about hard numbers. Hope-Milne confesses that the numbers depend on the campaign and weren’t necessarily high, but that the conversion rate (whch is critical) was very high. Evea revealed that BMW campaign was also run on Facebook, “but it was more succesfull on Cinimi.” It also proved more cost effective on the big screen linked to the second screen than on Facebook. “We are never forcing something that people don’t want,” Shazam’s Weedon echoes Hope-Milne. She also reveals that the algorithm works within one-hundredth of a second. “And it doesn’t matter if it is ‘Happy’ by Pharrel or some obscure national anthem,” but it does depend on the signal connection. Pearl & Dean stresses that even if you don’t have a data connection in the cinema it will retriece the data as soon as it has a connection. Pinn asks about privacy but Weedon bats that away saying that Shazam doesn’t require you to register. Last question is to Shazam about competition from the likes of SoundHound. Weedon says that there are lots of companies that do audio recognition (including Google and Apple) but Shazam has the specific expertise and 20 times the installed data base of our nearest competitor. “Bring it on,” she jokingly concludes. Pinn then wraps up the session by highlighting the other IBC Big Screen session that bring more ‘disruptive cinema’ as well as the ‘world first’ of 14ftL 3D laser projection with Atmos immersive audio. We will be bringing you those as well.